Welcome to The Neon Ninja© . com! FireFox Users may need to hit Ctrl F5 to refresh the cache. I just discovered that there is something called Trove that claims a Neon Ninja. This of course is an unauthorized character and I have taken steps to defend my character name. I know it's been a VERY long time since I updated this issue and the comic in general. I have been doing other things. I'm looking for an artist to continue the series for me that I can write. if you're interested, please contact me. I'm also hoping to continue the series and introduce the Argon Ninja, featured in a future cover in the archive pages. I know it's been a VERY long time since I updated this issue and the comic in general. I left off at page 12 - which has long been a 404 error, and today I uploaded it. It's not finished but I want to point the way that I'm finally finishing this story. It's hard to make a full Scooby Doo animation!!! This alone has frustrated me - along with a lot of negativity in my life and a persisten ganglion cyst which I blamed for not drawing - and so I've been focusing on other life issues and matters, and for that matter, been creating videogames for Android (see games link or www.blinkinstudios.com) including yours truly, the Neon Ninja! It's all free to play, so give it a whirl.. In the meantime, I'm taking a break from gamemaking to try and finish this story (issue 4) and continue without the naysaying that was in my life from 2004 - 2009. Sorry for the break, I'll try to return to a regular schedule.. sometime? As for this page, I'm going to redesign it fairly soon, but drawing comes first. Have a bright day! Today I was able to fix a longstanding glitch in all versions of the Neon Ninja game, relating to when you change characters. This may well have a noticable shift in what you can do in the game itself as development continues. For now, please click the GAME button to your left and enjoy it in it's new installer package! I was a day late updating the birthday cartoon (most of which have not been posted yet, I have to dig through the archives to find them all) because my mechanical pencil ran out of lead yesterday. It's hard for me to believe that 19 years have already gone by and we are already in the year 2010!! 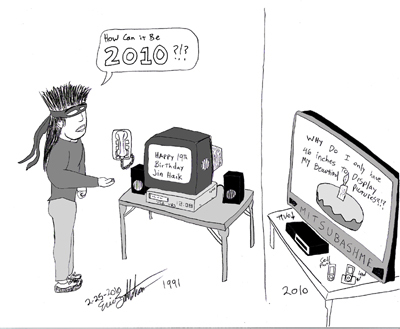 As I'm sure everyone is aware, there have been a TON of technology changes since 1991... but in a sense, even though they change form, some things always seem to stay the same..
Gasp! I've UPDATED THE TOON PAGE!!!! It only took 4 years! an explanation in story will be forthcoming on page 12, which will be a Youtube link actually.. and it won't take another 4 years, the product of the Youtube video has already been built, it just needs to be filmed and edited. The following pages of this current (issue 4) story have been drawn out, they simply need to be finished and scanned in, then edited. I'm hoping to resume this very shortly. I've updated the game to have an actual install/uninstall process for those who weren't able to get the game to run properly. It is available right here: .. also of interest.. My wrist is stabilizing and I'm now getting ready to finish this story and possibly get onto the rest of the stories in mind. 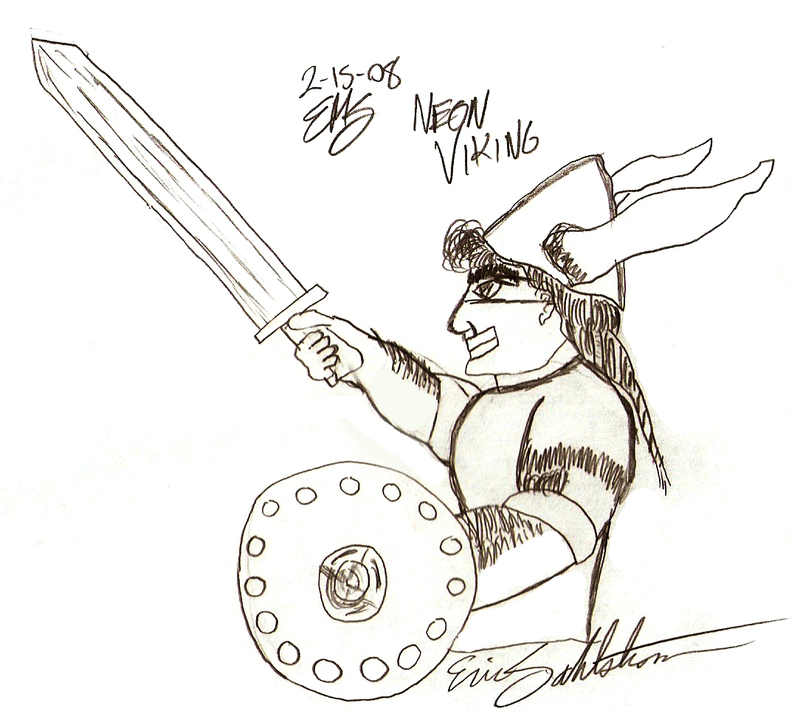 Had to include this update due to a suggestion from my heritage: the Neon Viking! Background story (copyrighted of course, that's why he's here!) is, he's Jin's longlost cousin. I'll incorporate him into a future story. Speaking of stories, yes, I am aware I haven't finished issue 4. My life is quite complicated right now, between work, school and church. I also have a ganglion cyst in my right (drawing!) wrist, which makes it painful to write or draw anything for extended periods. However, I have it planned to 1: have it fixed, and/or 2: hire someone to do the drawing for me! So for the two people that are reading the storyline, please don't give up hope forever! I've been doing a lot of updates to the game, which you can now follow it's progress here: and the game link button has been updated to reflect the new change. The game download is still 25 megs, but there's a lot of changes, as you'll see by clicking that link. Enjoy! So it's been a while since I updated the comic, and I thought I would offer an explanation as to what's going on. I have a ganglion cyst in my right wrist, which unfortunately, is on a nerve cluster in my drawing hand. The doctor I went to refused to attempt anything to correct it, meaning, I need to see a more competent doctor and probably have corrective surgery. It also means it hurts to put any pressure on it for extended periods of time. I can type, because it's not putting undue pressure on that part of the wrist. I've been trying to practice, build up tolerance levels to where I can draw again, so that's why there hasn't been any update (as I had previously promised) to the comic. I do intend to finish the storyline. I am also looking to hire an artist at some point to do the artwork for the stories for me (if interested, shoot me an email)..I really DO want to move on from where I'm at. As for the game changes, I'll let you see what all has changed, though I'll describe it a little. I'd like to take a time out to thank Erik Basilin for creating most of the music you hear in the game. Well done! The intro (which you can skip) is playable, if you follow the first issue, you know what to do : RUN!! Just -- GET -- AWAY! Grenades have been implemented, but where they are in the game, you'll have to find them! Added some more characters for more variety. the GAME HAS BEEN UPDATED!!! I've updated the game so that it now runs on Windows Vista if you have this new operating system. I WILL WARN YOU... it's big.. it takes a hefty machine to run it (I think...).... mine has 2 gigs (!!!!!) of ram and a 3 gighz processor, with a 256 meg pci-express video card, and to start the game takes a moment or two to initially load up. My laptop, which has 1284 megs of ram and a 1.8 processor, runs it quite slowly. So use it at your own risk.. if you have LESS than 1 gig of ram, DO NOT ATTEMPT. ...as for the comic, I'll continue that after I get back from England! WOOHOO! Oh, some of the updates in this version are some room to room transitions that were made available in the new version of GameMaker 7.0 that just came out. Some other fixes are the counting of the throwing stars as you throw them as at long last been fixed... however, when you jump left and try to throw one.. well, just don't hold your breath! ;) you might however, find new secrets doing the opposite side. I've also added some extra animations on the last level, still under construction, but which follows the 1st story. Still working on that boss AI!! Please feel free to leave any comments on the game at my email, listed above (note the comments on it). the COMIC HAS BEEN UPDATED!!! After about a year of not doing anything on the comic, but having consistent ideas of what I wanted to do with the storyline, I FINALLY sat down today and worked on some of the story. There's now two pages up, with more coming, I actually hired a friend to help do artwork! You'll find the updates starting with issue 4. The pages currently go to page 10, but I have up to 13 currently drawn, I just need to get them scanned in. Work continues! Still working and updating. Got several done today and looking forward to getting to the end of the story by page 25 (I hope!) I REALLY want to get going on issue 5! 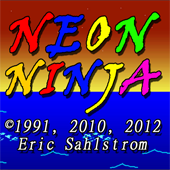 The Neon Ninja game continues its work in progress. The current demo is 16 megs and I'm working on a possible cd for the music or an extra way of compressing the music so the download isn't so large. The music itself is ten megs! Alas, I've had a data corruption somewhere along the way, but the good news is, that the next version of the Neon Ninja demo *should* be smaller and should function smoother. Bad news for me is that I have to hand copy all the sprites, bacgrounds, drawings and objects all over. Feels like the Six Million Dollar Man! At any rate, please feel free to browse the comic archives or try out the game (keeping in mind it's GOING to be changing, including better graphics) while I work on the Neon Ninja video game demo, linked below. It changes often, so check back. (If necessary hit CTRL F5 to refresh the page) I'm working on boss artificial intelligence now for the video game, getting Markonn, Darg and some other baddies ready. If you'd like to contribute to the game in any way, shape or form, feel free to email me! Music, drawings, bad guys, coding, animating.. I have others working on it, but am always open to new ideas as well. --Mata! Made a TON of changes (even since July 18th version!) to the Neon Ninja game demo, which has been updated, and which you can only download on this site..
Old glitches fixed, maybe some new ones introduced! You don't start out with the sword anymore. You have to prove your worth. The game is a lot harder but more fair. Fixed (7/29) 2 longrunning glitches with the Nemahns : 1, they don't ALL run away scared when the scaredy ones are hit by a star or expanding orb. 2, they shouldn't get quite as stuck going up terrain anymore. You (7/18) can actually FIND Murami, your sword, and Michael just as the introductory text says you're supposed to! Newer (7/18, 7/29) scenery and lots more yet to come! ALLright, well first, DIBS on the following zombie movie, will have a short story on it placed online later, and will develop the whole thing later.. Nuclear Zombie Showdown will be released later. Secondly, I never did the birthday drawing.. I never made it to the ECCC comic con like I wanted to. So what have I been doing all this time? Every year on Neon Ninja's "birthday" I draw a page. I remembered several times, when I was away from home, that I needed to draw something. Anything. Now it is too late for the actual day. Doh! And I am going to be busy all day tomorrow and likely Monday. So, happy late birthday, Neon Ninja! Had this idea and wanted to draw it before it got stolen from me. I'm still working on the game, but I've also returned to work on the comic. I would recommend, instead of reading the Intermission, with re-reading issue 3, then read what is available for issue 4 so far. Issue 5 *might* be for sale at a comic convention.. More details as they emerge. I'm still working on the Neon Ninja platform game, and I have an updated demo here. You will never beat MY Solitaire XP high scores! Recently I ran across this article on the web regarding Solitaire on Windows XP operating systems... I've been playing Solitaire on the computer since 2001 and recently began playing it more often on Windows Xp while doing memory intensive tasks such as video editing or Divx encoding. So last week I was interviewed via email, and this article is the tongue in cheek result. Thanks to Chris Messick for the delightful column! Enjoy, and if anyone can BEAT my highest scores (be sure to check back from time to time too, I will post new scores in the folder) be sure to email me. Tip: have at least one other window open so you can screen cap the cards flying when you win at Solitaire, and for your score; and for validity, try to keep the Solitaire window near the date and time on the bottom right corner for verification. A year ago, I purchased the rights to have a 2d engine built for production of a Neon Ninja game... that guy turned out to be a total flake and I was left high and dry. No more. I purchased my own program today, and am currently learning it's programming nature, and putting together a (hopefully) Mario 3 style sidescrolling adventure game. I hope you like it too! You can view the opening screen (still in early development) here. All screens and shots are copyright 2005 Eric Sahlstrom. As promised, I will be working specifically on Issue 4 this week, I got a head start today on the new first page... don't worry, you didn't miss it, because I haven't posted it yet since at least in the beginning of this story, there would be confusion if I posted only a part of it, and if there were a delay in it,... well there might be MORE reason for the FNAQ page. In the meantime, I present to you this INTERMISSION with which I drew while in Japan. It is a preliminary that ... kinda leads into issue 4 but not really. Really it was just for fun and practice. I'm also going to try to stick to the traditional comic book style for the WHOLE ISSUE instead of flipping the page sideways.. that will be a challenge for me, but I think I can do it now. My goal is to have at very least 1 page done per day this week, if not colored, then inked. I'm sooo sorry.. I've been super busy trying to catch up on hours at school, so I can pay my rent and such. Between that and needing time to unwind, Evil Genius has been sucking up my spare time. I will TRY to get some of issue 4 done this weekend. Spring break's coming up soon so maybe I can do a whole pantload then? /edit By the way, I'll be redoing the page numbering, there's a prestory I have to do for this issue (4). Whooppee!! My store is now open! Now you can get a favorite strip of yours on a tshirt, coffee mug or whatever Cafe Press has to offer! Click the link to your left! Be sure to check out some of the artwork which can also be added in the Cafe Press store. Also fixed: all this years posts had last years date on them - fixed! After nearly a decade of delays, I've finally finished the longest (timewise) story I ever started. (I have to color it and will do so tonight, and will be up by the time I have posted this) Issue 1 and 2 if you're interested, were done the same year (mostly in high school classes while supposed to be doing other work!!) in 1991 and going into 1992. I didn't even begin issue 3 since I didn't have a motivation for it after I graduated, and there was no public internet yet. (I had no idea who would read it other than my immediate friends) It's a milestone for me and a sense of closure and completion, as well as a new beginning - moving forward from where I began into a series. I will begin Issue 4 next week when I return from my vacation to California. Yeay, Mickey ears! Took down the guestbook 'cause all it's getting filled with are spams. So I am just going to leave the Forums up. Have fun! Registration is free. Welcome all, from the new ad on WhattheMuffins.com. If you're new to the Neon Ninja universe, click one of the following buttons above! I'm printing out some pages now, since I finally got my color cartridges working again, and MAN, ... they look good!! I wish everyone a Merry Christmas tonight! Please drive responsibly! Growing and growing and growing... For some reason, my Dreamweaver program was adding hundreds of additional, unnecessary, lines of code for different fonts.. this index page was up to 173k just a moment ago! I had to fix it by changing the fonts in Word, but it seems to be working properly now... more investigation later, right now, I got a eggnog calling me! Sorry to toot my own horn, but it's my birthday today - so there won't be any artwork for a couple days. I was pretty rushed to get the last two pages up, that's why they look more simple in the colorations. I never realized just how time involving a full page is for colorization before - penciling is EASY! the rest is the hard work! By the way, if you haven't already, check out What The Muffins and check out Matt's art gallery. It's pretty cool! One of the most unhappy Nemahn's I've ever drawn is now in the belly of another creature. Ugh! Heh.. I just wanted to make a small disclaimer to the next two pages I'll be putting up. I don't want to ruin the surprise here, but in case there's any confusion, this new character is my OWN creation, not a ripoff of anyone's certainly not some character called "Gleep" ? as mentioned to me by a friend. Again, without giving too much away, my characters's name is Spot, and he was first published in 1985 or 1986 in a school newspaper when I was in 5th grade. I've entered him here in ... why am I telling you this? Go read it for yourself! Pages 18 and 19 are now up!! I've been perusing the Issue 2 archive... and I'm not happy with what I'm seeing. The paper I used had degraded when I scanned it, and some of the lush landscape scenes that originally had ORANGE mountains - are a faded pink (???) so I am beginning tonight into tomorrow to color correct them, and then I will continue with the rest of Issue 3 and it's finale. Then 4. =) ... I think it will be worth the wait, and I will be correcting typos as well. Finished with Issue 2, didn't do EVERY single panel with words or color correction, but I think it looks better now. Rephrased a couple things to flow better, fit better with the story, etc. BY the way, I though I would add some handy tools that I use under the new TOOLS link. These specifically are for zooming in with either Internet Explorer or Firefox 1.0. Ok, due to popular request, I've begun editing some of the more obscure handwritten pages. Starting with the current issue and working my way backwards, forwards and sideways. It's not exactly a fun project but it has taught me to print more legibly and to type what are typically ending up as long sentences. You may also notice an increase of size of the last two (pages 16, 17) pages I've entered. Yeah, they're big screenwise, but I wanted you to be able to read the print I had typed up for the mock newspaper - which by the way pokes fun at a nickname for a local newspaper. Maybe they'll eventually decide that journalistic integrity IS important, such as getting basic facts straight! Oops, did I say that out loud again? I'm getting bad at that! :D More later today, look for page 18, and I'll try to do 19 as well. So,... I'm ready to do some drawing, I've already done some storyboarding, and I go to get my pencil... and it's gone, along with my new pink highlighter I just bought. I think they fell out of my coat pocket somewhere. My one and only pencil, which is mechanical, by the way, and the only one I can stomach to use - regular pencils to me are like scraping fingernails on a chalkboard - so I am stuck waiting until tomorrow until I can go buy a new mechanical pencil. I'd use pen, like in the good old days, but HEY, I don't have a finepoint pen, EITHER. (Only a blue Bic, which has lines too thick for what I want to do - I could black and white it but still...) so, ARRGH!! And another excuse for not going to the store tonight is that my alternator is bad. That's right, you read that right, my alternator is going bad, complete with fading lights and intermittent battery drainage... and that's actually not a lame excuse, since I don't know when it's going to finally die. The good news is though, that it is being replaced in the morning. I have such a nice landlord!! =) So in the meantime, I might just, ya know.... take the evening off, play some Xbox.. write some more of the Neon Ninja movie script.. oops, did I say that out loud? There are several archives of the Neon Ninja storylines. The first being the original handdrawn comics that were colored using fluorescent Accent markers on white copy paper, from 1991 to 1993 and occasional side projects. The second series ran briefly in the summer of 1999 until halted by a bout with carpal tunnel. The space series ran all inbetween, running from circa 1990 to present day. I'd like to note that the Big Space drawings were originally hand drawn and Bigspace 3 was drawn in late 2002, over a course of 17 days, not computer generated. Neon Ninja, or Jin, as I call him, was created in 1991. The gist of the story (an origin story has finally been finished!) is of a "hundred year old" (in numbers only, see the story) ninja chosen by his clan to defend his village, given magical powers to control mystical lights to confound/confuse his enemies. In the course of major battles he was thrust in time, along with his enemy, into 1991 and revived from legend. He has followed his arch nemesis, Markonn, from Habukulai, Japan, to Portland Oregon. Neon Ninja has been in comics online since 1999, before that he was on television in brief cameos on the WWAZ show, as well as appearing in t-shirts and other publications. The Neon Ninja.com is not responsible for the content of this linked site. Proceed at your own risk.